Hans Rosling’s 200 Countries, 200 Years, 4 Minutes – The Joy of State – BBC Four video published in November 2010 is still one of my favourite examples of Data Storytelling. 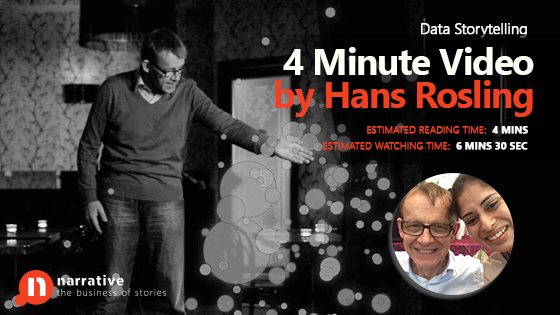 Many credit data visualisation and technology used for this amazing video but in my view the beating heart of this fantastic data storytelling video is Hans Rosling’s ability to storytell. I have been fortunate to meet him and witness his magic in person. I am listing the key learnings below for anyone who wants to use them and make their own data led presentations enjoyable and understandable. Let me start by stating that the spontaneity in this video is only an illusion, there are methods that can be decoded, learnt and applied. Rosling Introduces the X and Y axis with key numbers on each axis. In Y axis, 20 years , 50 years and 75 years. In X axis income $400, $4,000 and $40,000. I am yet to come across anyone who presents data and uses this technique. Most of us think, its already there on the slide, why bother? However, an introduction reduces conginitive load on your audience. They are not having to look and figure it out whilst you are presenting. You can watch this 60 sec video to understand more about cognitive load. Giving audience an idea that if they see data in a certain place on the graph what that indicates. He says , ” Down here is poor and sick and up here is rich and healthy.” This again is a way to reduce cognitive load. You are preparing your audience before you start showing the data and not leaving them to figure it out for themselves. Rosling starts with, ” what was it like in the past and uses a time-marker 1810. You can watch my 60 sec video explaining how to start a story with a time marker here. Rosling says, ” In 1810 it was pretty crowded down here. In lesson #2 we observed that he has already told the audience, if they see the data in a certain place in the graph it means people are sick and poor. So, he is now using that space on the graph to tell people that majority of world’s population is here. Think about your presentations, how can you make such references which are easy to understand. He points out that for the majority of the population life expectancy was below 40 years and only speaks of the exceptions being UK and Netherlands. Use this technique in your presentation to highlight a trend, pattern or anomaly from data. He is sharing an insight on what is causing the numbers to move versus just stating the number is moving. This is a very common mistake in data led presentations, we often hear presenters say, ” our revenue dropped, picked etc but rarely do they ever get down to explaining what causes for the numbers to behave the way it did. He brings humour to the presentation by saying,” Sweden topped the Winter Olympics and I was born.” This makes his communication personal and funny. Think about presenting a lot of insights from data and just before you present the most relevant one you say, ” and this is the one I am most proud of because I worked hard to get to the bottom of it. ” Add personal feelings towards presentation breaks the monotony and engages your audience. Out next blog will cover rest of the key learnings from this data storytelling video.